it would be great to look back at 2017! On Thursday, September 14th, 2017 beer and whiskey lovers flooded in from Southern Connecticut and New York to attend New Neighborhood's (NNI) Stamford Brew and Whiskey Festival. Altogether, NNI raised over $35K to fund the expansion of senior housing in the Fairfield Country region. First County Bank Foundation - New Neighborhoods, Inc. was awarded a $10,000.00 grant from First County Bank Foundation. HSBC Grant - New Neighborhoods, Inc. was awarded a $5,000 grant from HSBC. The funds were allocated for the continuation of our financial literacy programs. Cathleen Miller Raises Over 1 Million - NNI's Construction/Asset Manager Cathleen Miller was able to help raise over 1 million dollars in grants! On Thursday, April 27th a solar panel installation kick-off was held at 80 Fair Street in Norwalk, New Neighborhood's 57-unit multi-family apartment building. 80 Fair Street is the second building to "go green" at NNI; the first being Samuel's Court, New Neighborhood's property in Danbury. 2017's Summer Meals Program provided breakfast and lunch free of charge to individuals aged 18 and under from early July to early August. All together we were able to serve 5,528 meals. 2017 was a great year for NNI's Property Management Consulting Group! They've signed yet another client, Sedona Group of Norwalk, Ct.
On September 21st, senior residents gathered to celebrate The Atlantic's 20th anniversary. Accompanied by their tenant advocates, the residents shared a meal to celebrate the buildings longevity. On November 17th NNI residents, tenant advocates and members of the Stamford community gathered at the Martin Luther King Jr. Apartments to learn about the wonderful benefits of healthy lifestyle choices. Event goers were given free books, fresh produce, healthy recipes, contraceptives and free health screenings. On Monday, November 20th and Tuesday, November 21, 2017, NNI hosted our Annual Thanksgiving Turkey and Chicken Giveaway, a two-day event dedicated to passing out turkeys and chickens to NNI families. NNI provided a record-breaking 369 turkeys and 100 chickens to residents, staff and other nonprofit organizations. New Neighborhood, Inc. hosted it's fourth Annual Winter Warm-Up event in mid-December. Residents enjoyed light refreshments, face painting and got a chance to write letters to Santa. 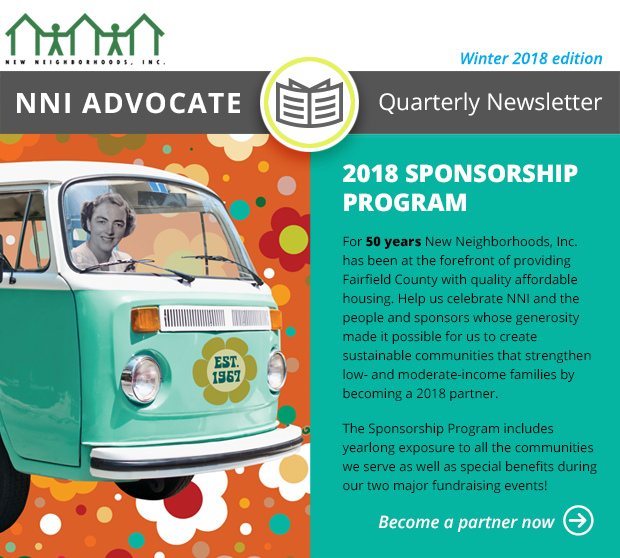 NNI was able to supply over 80 residents with coats, sweaters, pajamas, gloves, scarves, and hats to help prepare them for the chilly months ahead. New Neighborhoods, Inc. was able to raise a total of $3,200!! We appreciate your generous gifts and continued support. Announcing new board members ! New Neighborhoods, Inc. is pleased to announce the addition of three new members to the Board of Directors: Matthew Edvardsen, Peter Helmes, Ellen P. Tower.